Soak in the presence of the Lord with Instrumental Prophetic Harp Music! International prophetic harp instructor, Michael-David invites you to experience a taste of the heavenlies through these Spirit-breathed songs on CD! A Prophetic Harp and a Golden Bowl was created to usher you into the Throne Room of God, where the 24 elders with harps receive the prayers of the saints in golden bowls as incense (Rev 5:8). This CD was birthed during hours of worshiping in the presence of the Lord. With the lyrical strains of the solo harp, weaving intricate, lush, layered harmonies, you will experience a foreshadowing of the sounds of heaven. Passionate and spontaneous melodies portray prophetic themes that reflect lyrics straight from the Word of God (included on the insert). This music is well suited for your own times of personal devotions, for use during times of prayer and altar calls, and special moments that call for healing and deliverance. You will be blessed by my international students from the Jerusalem School of the Prophetic Harp who are featured on tracks 5, 6 and 9, where 14 harpists worshiped on the Mount of Olives for 30 days (pictured above). This recording took place at the Jerusalem House Of Prayer For All Nations where there has been 24/7 intercession and worship for over 24 years (consequently, it was a highly supernatural time of worship). Psalmist and inventor of the HarpellaÖ, Michael David is working together with Kingdom founders Johnny and Juanita Berguson to introduce the HarpellaÖ as a new instrument for worship. Click here to learn more! Note from Michael-David: this album is entirely original music and was created during intense times of worship. 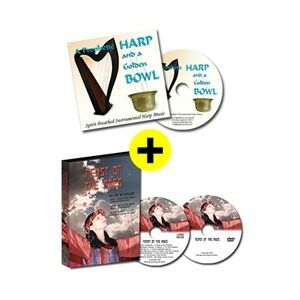 This instrumental harp CD has no singing, however, most of the songs were originally inspired with lyrics that were sung spontaneously as received from the Lord. Here are the words associated with the songs and any background or scripture that is referenced. This instrumental track can be sung with these modified words from Gal 2:20-21. This instrumental track can be sung with these lyrics. This instrumental track can be sung with these modified words from 1 John 4:4 and Jeremiah 29:13. As the Lord gave this melody the feeling that was inspired was that of ""Mercy"". This instrumental track suggests a prophetic cry for mercy poured from the throne of God and brings to mind Hebrews 4:16 (NKJV): ""Let us therefore come boldly to the throne of grace, that we may obtain mercy and find grace to help in time of need."" This instrumental track features the sound of 14 harpists who were students from the School of the Prophetic Harp, Jerusalem 2010, and can be sung as a round with these modified words from Rev. 4:8. This instrumental track also features the sound of 14 harpists who were students from the School of the Prophetic Harp, Jerusalem 2010, during an intense moment of worship. The heavenly sound brings to mind the scripture in Revelations 14:2 (NKJV) - ""And I heard a voice from heaven, like the voice of many waters, and like the voice of loud thunder. And I heard the sound of harpists playing their harps."" ""I will fulfill my vows to you, O God, and will offer a sacrifice of thanks for your help."" This instrumental track evokes a sense of solemnity as we approach the throne of God. Then, as we enter into His presence, it is with joyful hearts we can offer thanks. As we make our commitment to Him we can have confidence that He hears our prayers with great compassion. 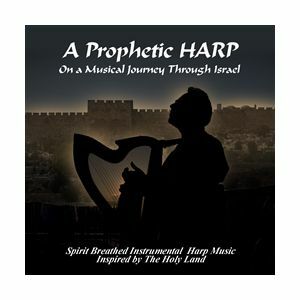 This instrumental track again features the harpists from the School of the Prophetic Harp, Jerusalem 2010. During performances, it was with great joy that the words of the psalmist David were heard throughout the land of Israel as they sang Psalm 19:14 (ASV)... ""Let the words of my mouth and the meditation of my heart, be acceptable in Your sight, O LORD, my strength and my Redeemer.""